This Digital Leadership Framework was developed from our experience in coaching 1,000+ leaders in digital since 2006. It is a checklist for leaders to see their progress and to appreciate the many aspects learnt and developed over time. Below you’ll see more detail on each piece of the chart. Leaders self-assess their understanding of specific segments relevant to their job then fill gaps and continue to deepen their experience, skills and understanding. Organisation- and team-wide assessments show learning progress over time. 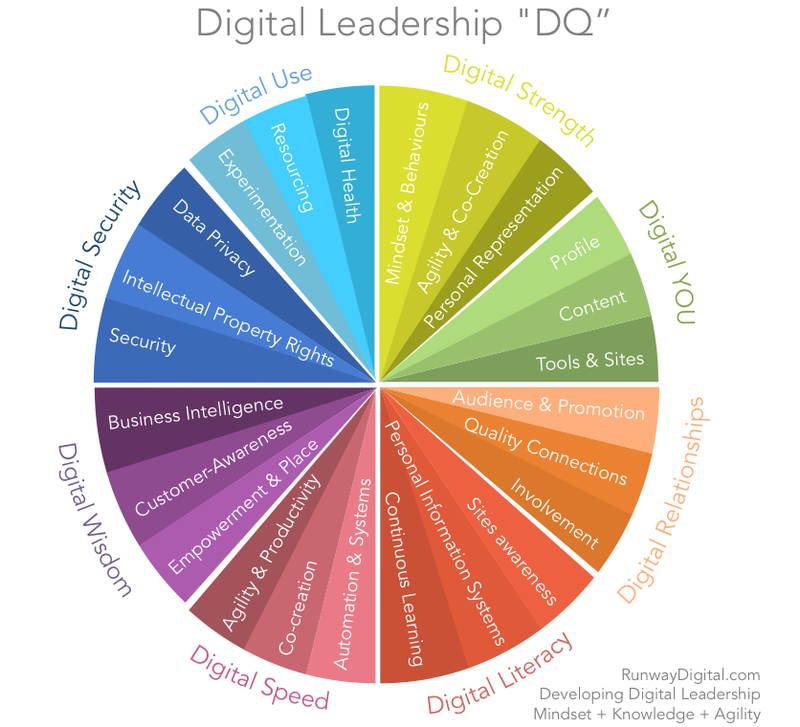 A detailed look at the Digital Leadership Framework. Try it out as your Digital Learning Plan. Awareness of & openness to rapid change. Online behaviours – Integrity, openness, respect, empathy, prudence. Participate, know the rules, timely responses, disclosure, engaging & sharing, being aware of the risks you create from posting certain content. Digital ethics – digital diligence, ethical product design, automation (AI) rules & ethics. Listening, social & emotional awareness, respect of others’ ownership & empathy. Autonomy – to get things done, to be responsible for your online representation, info systems and increasing productivity. Simplicity… it’s the new trend. Think: Uber reducing complexity of ordering a taxi and its simple app. Seeking opportunities and find potential risks and smartly (fast) addressing who needs to be aware of them. Sharing, collaborative culture – seeking to provide value and share – within an organisation and as an individual to engage relevant people & industry / market influencers. Agile and responsible decision making – speed, intuition & trust is of the essence. Encouraging this in your workplace for you and your peers. Constantly being industry- and market-aware, finding risks & opportunities, creating innovation, encouraging innovation. Personal branding for future employment and to promote your organisation (e.g. entrepreneur tweeting “Another great meeting with the Bank”). Being consistent across all sites. Appropriate and engaging organisational representation. Digital footprint, who sees you, what you put online. Clear target audience. Representing yourSELF online – your key attributes, experience and thought leadership. A true, long-term representation. Seeing the consolidated online profiles across the company. Engaging and clever content targeted at your audience. Setup of content planning, creation and publishing systems – including engagement of ghost writers as required. How to write professional online posts. What, when, where, who. Who do you want to reach, who will promote you and how. How to broaden your audience & influence. Audience Outreach Planning – Sharing your experience, thought leadership and findings (such as your latest project / initiative). How to reach people who are interested. How to get onto relevant podcasts and influential sites. How to promote you and your business / the organisation you work for. Connecting with colleagues, industry peers, previous colleagues and organisations. Connecting with new contacts who get to know you / can send you relevant information & influencers knowing you. Contact risks and your personal rules for sites such as LinkedIn. Contributing in relevant forums and in places people see you as a thought leader / contributor. Promoting you and your organisation. Knowing social media sites & tools, using them, learning the languages and seeing how they work (beyond theory). apps, useful alerts, email unsubscribing, tailored inbound information on relevant sites such as Twitter and Reddit. Keeping up to date with new sites & tools that are relevant for you and for your organisation. Finding apps and tools that will help, experimenting with and evaluating. Internal communication & collaboration tools (e.g. Slack, Yammer). Collaboration tools to connect you and your organisation with supporters, partners etc (e.g. use of relevant platforms – such as Facebook Messenger between organisations and people in Singapore). Open innovation. As relevant, involving your colleagues, industry peers, customers and stakeholders in developing new processes, products and services. How can you extend your collaborations with partners and suppliers? Being aware of and integrating into business and life: process automation, API Economy, AI, Machine Learning, Robots, IoT, and more. Learning the latest, relevant business digital tools – such as Artificial Intelligence, Machine Learning and Deep Learning. Finding/seeking relevant innovations, new business models, new business & life trends (e.g. VR), and integrating this into relevant internal channels so you and other relevant people (in your organisation and beyond) act. Customer awareness throughout your organisation. Being aware of your impact on the customer and engaged to enhance their experience. How can extra value be created for customers? Do customers experience a unique, engaging, seamless customer experience, independent of the channel used? What do customers engage in online? How do they move through your organisation’s & the market’s channels? What can you involve them in? Making sure you and your organisation are relevant, purposeful & contributing to the global economy. Think: UN’s Sustainable Development Goals. Know where you do your best work and encouraging this in/for others. Working in different spaces for different activities. Virtual meetings, VR meetings, location independence, remote operations. Job-sharing, global talent/workforce, fluid work, diversity. Apps (the sea-saw of trading privacy for ease of use / productivity). Data ownership (e.g. Facebook data ownership). VPNs, hardware security (mobile, desktop, tablet and other devices). Setting up experiments, use of metrics (choosing relevant ones) and tracking / reporting / analysis / reset. The pie chart representation inspired by the digital leadership skills for children by impressive DQ Project as see on the World Economic Forum site. Ross Dawson’s Humans in the Future of Work model. We’re here to help you and your team. Learn more about our services and get in touch to explore.